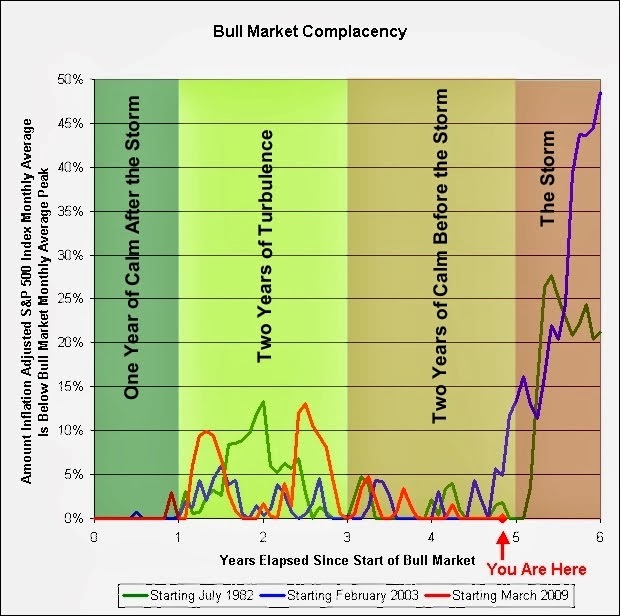 Credit Bubble Stocks: "Theory: The Four Phases of Extreme Bull Market Complacency"
"Theory: The Four Phases of Extreme Bull Market Complacency"
There are so many indicators signalling that it's time for a comeuppance. The Fed, seeing the struggle, opts to raise interest rates. We have been unable to achieve that step in Act II. It's not a good thing. Go figure. Those really are our pets by the way, although our cat passed away about a year ago. Ah, the '87 correction barely lasted 8 months and the market recovered all its losses and was again in the midst of its great bull run. Ditto for the '09 gov induced reversal. Those that stayed the course got back all their losses and more as of today. If there is a lesson it is that you can't time market moves and to stay the course. History has proven you get back to no less than even in a short amount of time. Ah, the '87 correction barely lasted 8 months and the market recovered all its losses and was again in the midst of its great bull run. You once again back my theory that investors are too complacent right now. The lesson apparently only applies to the United States after our housing bubble popped. Japan's investors are still probably trying to figure out what went wrong with the history lesson. I mean really. They had a grand old party from 1950 to 1990, then something really bad happened to their real estate market and they were permanently stuck in ZIRP. Of course, can't happen here though, other than the really bad thing happening to our real estate market and being stuck in ZIRP part. That's what I'm told continually told anyway, by people who point to a rising market as proof that the market will continually rise. History has proven you get back to no less than even in a short amount of time. Has it? It sure hasn't proved that in Japan. This guy is just begging for it.